Accompanying someone into death is an experience that many of us have shared. Some people do it daily as part of their work or ministry. I know the journey personally. A little over a year ago I lost my wife to brain cancer, writes Garry Everett. None of us knows what it is like to die. Some, if not many, of us have accompanied someone in their dying moments. In Bourke Street, Melbourne recently, during the car-rampage slaughter of innocent people, a woman found herself in this very situation. She tried to save the life of a dying stranger, but was unable to do so. However, she left a poignant note with his body which said: “You never knew me and I never knew you. However, I was present at your death”. It obviously mattered greatly to this woman that she be with the dying man, and it seems that she believed it would mean as much to him to know, somehow, that she was there. Accompanying someone into death is an experience that many of us have shared. Some people do it daily as part of their work or ministry. I know the journey personally. A little over a year ago I lost my wife to brain cancer. Soon however, we may be confronted with a different reality – helping someone to choose to die, or helping someone who has chosen to end their life. Assisted suicide is currently on the public agenda in many parts of the world. Here in Australia at least one State government is about to consider draft legislation to make physician-assisted suicide legal. Any such legislation that might be approved will be hedged about by conditions and safeguards. Jesuit priest and lawyer, Father Frank Brennan though, has warned us that the law is a “blunt instrument”, and we need to tread warily. Why is it that some in Australian society, with much of its value system derived from strongly Judaeo-Christian sources, can even entertain the idea of legalising assisted suicide? These sources provide clear teachings on suicide, euthanasia, (and by inference) assisted suicide. Such teachings on this subject are all rooted in beliefs about the dignity of the person, the sanctity of life, the inalienable right to life, and in our relationships with self, others and God. These stances have been developed over centuries and have stood the test of time. So why seek to legalise assisted suicide now? The answer to this question lies within the thinking of the proponents for change. Any search of the professional literature on the topic will reveal a great deal of argument for and against the notion of assisted suicide. There are, I believe, at least four basic points of difference between those who propose, and those who oppose, assisted suicide. The first difference is found in the varying claims about human rights. Proponents claim that there exists a fundamental right to the freedom of choice, and that freedom applies even to the choice to end one’s life. On the other hand, opponents speak of the right to life, and that right is inalienable. A second point of difference is centred on understandings of the Hippocratic Oath. For opponents, this oath, in its classic form, is fundamentally expressed as doctors should “do no harm” to patients. The oath is rooted in notions, expressed in the oath, of “the purity and holiness of life”. The modern expression of the oath, often cited by proponents, allows doctors to “take a life if necessary”. For proponents, such a decision is regarded as the end point of palliative care. Most opponents do not regard such a decision as belonging to palliative care at all. A third point of difference concerns the notion of “the slippery slope”. Those opposed to assisted suicide argue that once permission is given to physicians to help people to die, it will gradually be expanded to include relatives, friends and others. In addition, they argue that in the future, “the slippery slope” will include a provision that patient request is not required. Opponents have also expressed concern that the legislation could be expanded to include people who are not terminally ill, but who are frail or seriously disabled, physically or mentally. Proponents, on the other hand, tend to point to statistical evidence from places where assisted suicide has been legal for 20 years (e.g. Oregon in the US) and argue that there have been no “slippery slope” experiences, perhaps because of the safeguards built into the legislation. Finally, there is a difference between the two groups based on certain economic considerations. Those in favour of assisted suicide argue that the money spent on keeping someone alive, when their condition is short-term terminal, is a waste of taxpayer’s money. Those funds, they suggest, could be better spent elsewhere in the health system. The other side argues that it is legitimate to spend money in not hastening death, and in prolonging life, because the health system is designed to protect life. It is important to note that it is not only the content of the various arguments that matters, but also the ways in which those arguments are communicated to society at large. As Marshall McLuhan wrote many years ago “the medium is the message”. In brief, the proponents of assisted suicide have successfully used all forms of media, especially social media, while those opposed have tended to rely more on print media and lengthy, tightly-argued moral and ethical discourses. Each medium has its strengths, but as the new US President has demonstrated, Twitter has an unparalleled power of immediacy and brevity that powerfully influences the minds of busy people. The dominant characteristic of social media is simplicity. Consider Donald Trump’s challenge: “Drain the swamp”. The message is direct, clear, not nuanced, and does not invite conversation. The traditional approach of lengthy, well-reasoned, dialogic argument is regarded by users of social media as too time-consuming, too complicated and, I suspect, too demanding of sustained thinking. Hence, proponents and opponents are like the two proverbial ships passing in the night. Each is aware of the other and their individual direction; they acknowledge the other’s intentions, but there is no meaningful interaction between them. It is as though one communicates by using electronics, the other by a system of flags. Ultimately, the fundamental difference is between accepting that there is an everlasting life, and accepting that when this life is over, it is all over. Such acceptances are not necessarily expressions of faith. Proponents and opponents may well have reasoned their way to different conclusions, or even the same conclusions. Even those proponents who believe in life after death can still form the view that helping someone in a terminal condition to arrive at death sooner and without pain is a good thing to do. Unless the opponents can counter that view and deal with the strong emotions on which that view is often based, there is little likelihood that the opponents will prevent the legislation taking foot-hold in this country. The matter is indeed complex and controversial. Opponents of assisted suicide must resist the trap of being complacent and secure in the fortress of tradition. One role of scholars: theological, biblical and ethical, is to prevent tradition from “resting sleepily on past practices” as French theologian Father Xavier Leon-Dufour once wrote. In his foreword to Australian Father Frank Moloney’s book, A Body Broken for a Broken People, Leon-Dufour also emphasises that the “self-defensive reflex action of the institutionalised body of the Church ought… to be always counterbalanced by a profound reflection upon the attitude of Jesus of Nazareth”. He makes it clear: “Jesus lived the Gospel of mercy… What is more, he spoke first of all to the poor, the broken. In Jesus’ vision of things, what matters is not righteousness in the observance of the commandments, but unconditional commitment to his person, love of God and love of others”. Perhaps the coming debate on assisted suicide will allow the Church to examine the counter-balance once again. It would be a mistake to see the stances of the proponents and opponents as denying the existence of alternative stances. One possible alternative would be to shift the focus of our efforts to better understandings of, and responses to, dying and death. In my life experiences I have noticed that Australians generally, and men in particular, are not comfortable in talking about dying and death. It’s as though the reality of death is too intimate to discuss with others. There is also a difficulty with appropriate language. We struggle to find the right words because we don’t know what to say, either to the one who is dying, or to those who are grieving. It need not be this way. “I once asked a man who knew he was dying what he needed above all in those who were caring for him. He said, ‘For someone to look as if they are trying to understand me’… I never forgot that he did not ask for success but only that someone should care enough to try”. Those dedicated providers of palliative care also remind us of the importance of just being there. To be with the person who is dying is a small example of maintaining a sense of human community. Many people who are near death express a fear of dying alone. Unfortunately today, the sense of aloneness is often exacerbated by the busyness of the lives of people which prevents them from just “being there”. It seems, too, that the preference for tweets, texts and voicemail in our communications has also contributed to the sense of loss of community, of being in communion with others. Perhaps, if we proactively campaigned to help all people to understand dying and death, and how to accompany someone in compassionate and loving ways on this journey, we may find that there is no need to campaign for, or against, assisted suicide. It is not a contest just between palliative care and assisted suicide. It is a universal challenge to understand and value dying and death, and how we can best accompany, or be accompanied, on that journey. 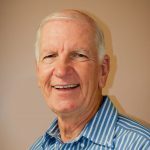 Garry Everett has spent all his professional life, as well as much of retirement, as an educator, and mostly of adults. Garry’s enduring interests lie in family, Scripture, theology and Church renewal. At a local level he is involved in social justice and ecumenism. He is also a member of his parish St Vincent de Paul Conference.